A 2007 study by neuroscientist Richard Davidson suggests that meditation improves attention and may even help with attention deficit disorder. Richard Davidson, professor of psychology and psychiatry at the University of Wisconsin-Madison, has conducted several studies on the effects of meditation on the brain. Being a regular meditator himself, Davidson is also a long time friend of the Dalai Lama. In this study, he was allowed to examine the brains of several Tibetan monks with a very long meditation practice and compare it to people without previous meditation experience. In collaboration with colleagues Brefczynski-Lewis and Lutz, Davidson conducted a study that compared meditation novices to long time meditators. Both groups were asked to meditate while undergoing a magnetic resonance imaging scan (MRI) of the brain. The meditation used was a practice where one focuses intently on a stimulus and then repeatedly goes back to the object of meditation whenever the mind has wandered. The MRI scans revealed an increased activity in the brain regions used for paying attention and making decisions. Thus, meditation seems to train the corresponding regions and functions of the brain. It was also found that the areas of the brain connected with attention and decision-making (such as the prefrontal cortex) were more activated in long-term meditators than in the meditation novices. Most fascinatingly, however, an altogether different picture emerged when looking only at the most experienced meditators with at least 40,000 hours of experience (equivalent to meditating five hours per day for 22 years). In that group, the same areas of the brain only showed an increased activity at the beginning of the meditation. After that, the brain activity went back to baseline. The conclusion drawn by Davidson is that these persons were able to concentrate effortlessly, something that has often been described in classic texts on mediation. Although he doesn’t completely rule out that these results may have something to do with the differences of lifestyle between the Buddhist monks and the ordinary American people observed in the study, Davidson doesn’t think so. Pointing out the correlation between the length of meditation practice and the amount of changes in the brain, Davidson assumes that the changes were indeed caused by meditation (rather than lifestyle factors such as isolation, eating habits or religious faith). Another evidence for the neurological benefits of meditation comes from another study by Davidson. It shows that the ability to detect a brief visual signal that most people cannot detect is significantly improved in people who were trained in meditation over the course of three months. This study can be regarded as further evidence of the so called neuroplasticity of the brain – the brain’s ability to reorganize itself by forming new neural connections throughout life. While psychologists have long tended to consider an adult’s capacity to pay attention as relatively fixed, these findings suggest that attention can be trained in a similar way as other abilities. Just as regular workouts improve cardiovascular health, so the systematic practice of meditation can train and improve attention. 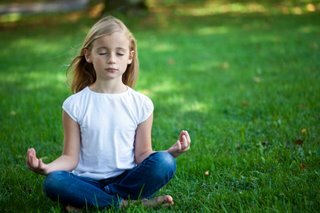 With a view towards a growing prevalence in hyperactivity disorder among children, Davidson regards meditation or methods derived from meditation as possible tools for dealing with hyperactivity. He stresses, however, that it is not more than a possibility as yet. “Brain scans show meditation changes minds, increases attention.” Online article on the University of Wisconsin-Madison’s website. You might also be interested in the following articles on how meditation increases the size of the brain and on how meditation changes the brain. Furthermore, you can read about a related neuroscientific study by Antoine Lutz, called “Can meditation sharpen our attention?” (University of Wisconsin and Madison’s website).